The Kanger SUBOX Nano is one of the best milestone sub ohm box mod vaporizers on the market. It has a perfect balance of performance, functionality, and features. Providing some of the best hardware for entry level or high end vaping. The SUBOX is well rounded and provides a great experience. Kanger SUBOX: What’s The Fuss? 0.3ohm, 0.5ohm or 1.5ohm coils. First impressions on the design of the Kanger SUBOX are pretty average. They’ve managed to make an incredibly easy to use and simple to understand sub box vaporizer. You can tell the intentions with this device was to provide an easy to understand layout for entry level vapors; while still providing that high level of quality you expect from kanger. The strength of the structure is outstanding; however, the huge glass window in the tank will more than likely be a problem if you was to drop the device. The size of the device is 82x38x18.5mm making the Kanger SUBOX around the medium level of size for sub ohm vaporizers. It has quite a decent height; however, the body is rather small and easy to hold. The weight of the device feels like it’s quite imbalanced. With the majority of the weight coming from the tank it feels kind of weird to hold, although, you’ll probably get used to it. The box mod feels a little thin and lightweight; great for a portable vaporizer. Adjustable Wattage – As mentioned, you have the ability to change the wattage on the mod. You can do this with two buttons located on the bottom face of the device. You can cycle from 10-50W range. Always ensure you know the capabilities of the atomizer you have before you change the wattage. Adjustable Airflow – As expected with a device of this size and power, you have adjustable airflow on the tank. It gives you great control over the vapor/air balance when pulling from this device. When using the device on higher wattage settings, it will also help with cooling the temperature of the vapor that you’re pulling. OLED Screen – The Kanger SUBOX hosts a small OLED screen on the face of the device, this will give you some important information such as current wattage settings, battery level, and even coil resistance levels. You can expect the performance of the Kanger SUBOX to be pretty standard. It has the potential to keep up with the other devices on the market. However, it seems to be well balanced maintaining average performance throughout each of the variable wattage and atomizer settings. When using each of the atomizers with different wattage settings you will always have a decent amount of vapor production from the Kanger SUBOX. The high performing battery seems to handle well at high wattage settings as well as low settings, making it extremely versatile and customizable. If you’re looking for that huge vapor cloud which this device is more than capable of performing, you should then go for a higher resistance coil with more wattage. If you’re looking for more flavor and less vapor then simply go for the opposite. You also have the ability to choose between Mouth to Lung or Direct to Lung pulling methods; you’ll have to ensure you swap out the atomizers and wattage settings accordingly. The battery on the Kanger SUBOX will last for a full day’s moderate use for sure. You can expect to keep a high standard of performance throughout the charge of the device. There is not much of a drop off in performance on low battery levels. Charging the device can take anywhere between 1 – 2 hours. The straight through charging port also gives you the ability to use the device when it’s charging. There are not many improvements that can be done for this device to be perfectly honest. They’ve managed to provide an extremely functional starter kit which can also provide decent performance for any higher level vaporizers looking for an easy box mod. It’s safe to say that Kanger has managed to take the market by storm with this vape starter kit, providing huge amounts of performance, functionality, and features while still keeping the price tag on the smaller side. Anyone looking for an entry level starter kit that they can use for a good amount of time will be more than satisfied with this kit. 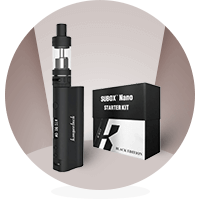 When you’re getting a kit like the Kanger SUBOX it’s important that you fully understand how to assemble and use your device. It will help you get the full potential out of the device. To understand the device and know what you can do with it is a key factor for sub ohm vaping with a box mod. Priming the Coils – Before you use the device you will have to prime the coils, you can do this by dripping juice on the exposed part of the coil. Putting juice on the coils will soak them, stopping them from burning when the device powers on. Filling the tank – The device has a bottom filling style, this means every time you want to refill the tank you’ll have to remove the atomizer. The user manual will provide you with information on how to do this correctly without causing any damage. You will want to leave the tank for 5 minutes after refilling to allow the coils to soak a little more. Replacing the atomizer – After a good couple days/weeks of use (depending on how regular you vape), the atomizer will start going dark in color. This means it’s time to change it, similar to the process of filling the tank you will have to remove and replace the atomizer. After you’ve replaced the atomizer, you will have to re-prime the coils of the new one. With a box mod sub ohm device it’s important to ensure you’re maintaining and looking after your device. There are two reasons why this is important. Having to remove the components, clean them and rebuild the device will give you confidence with the device, allowing you to easily replace and repair hardware components when they start to fail. Also, a well-maintained device will greatly increase the performance of the device as well as increase the lifespan by quite a significant amount. It’s recommended to completely take apart and clean each component individually whenever you need to replace the atomizer. I would also recommend wiping down the exterior of the device whenever you get the chance; this will stop any buildup of dust from entering the insides of the device, this will start causing issues with connections. The most common firing issues are when the connections are over tightened. Whenever you’re removing components from the device, ensure you only tighten them finger tight, anything more than this can start to cause issues. Another common problem is dried e-juice/liquids on the connections. Cleaning and maintaining the device will keep control of any dried juice on the connections that could result in firing issues. The last major problem that causes firing issues could be with the atomizer. Always ensure that you seat the atomizer correctly if you don’t correctly seat it; it will stop the device from firing or powering on. You can find additional information in the user manual provided with the device. Always make sure you read and fully understand the user manual before you attempt to use the device. You can look online for additional information on the Kanger Website, forums, and threads. For around £38.99 this starter kit is incredibly cheap, however, this is the reason it’s sold out pretty much everywhere. The design is perfect, they give you the right amount of features and keep it nice and simple. The performance is well rounded and well balanced, you can expect a high standard of performance no matter which wattage setting you’re using. The Kanger SUBOX is the best starter kit for box mod vaping on the market, and there’s a reason it’s pretty much sold out everywhere. If you’re looking for an entry level device that you can get used to and eventually customize when you’re comfortable with sub ohm vaping then look no further. Kanger has provided a huge amount of quality, functionality, and performance with this amazing kit. Looking for the best vape out there, then look no further. Check out Kanger DripBox 160 TC Starter Kit Review and find out what it is all about. The Kanger Juppi Box Mod comes in at around $49.95 you can expect a huge amount of performance, functionality, and features from this starter kit.